Blockbuster’s recent bankruptcy filing was yet another chapter in the Clayton Christensen annals of disruptive innovation. A major brand with convenient locations that got disrupted by a website and the U.S. Mail. Note that we’re seeing the backend of the disruption, when it all seems so clear. A technology initially addressing low-end market needs that slowly moves upstream as its capabilities evolve. From that perspective, think of all the things out there that have stayed low level and did not disrupt industries. Disruptive innovation is like a Category 5 hurricane: powerful, slow-moving and rare. Which brings me to the Apple iPad. Are we witnessing a disruptive tropical depression? 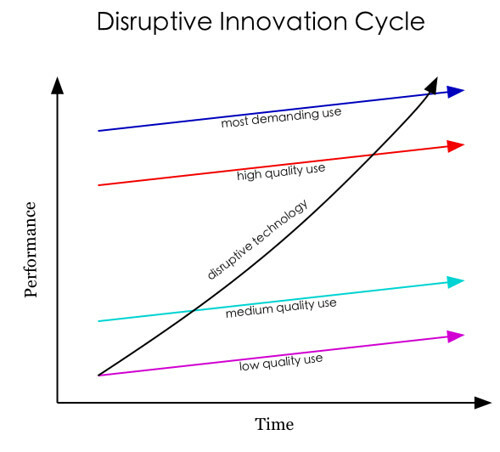 The graphic below (via wikipedia reproduced on the TouchDraw iPad app) describes the levels of usage for disruptive technologies. The target of the iPad here is the global laptop market. In that context, the beautiful, sublime, innovative iPad is solidly…in the low quality usage band of the chart above. What represents the iPad’s “low quality use”? “Low quality” is not a pejorative term here. It’s a reflection of the computing power needed for the listed activities. This is the iPad’s entre into the laptop market. Consider how much of your own digital activity is covered by those items listed above. IPad already offers a great experience here. Indeed, the Best Buy CMO recently confirmed the iPad’s move into this end of the market. When you see those low quality uses, they’re primarily consumption oriented. If they are production oriented, they’re pretty basic. But there are things that can be done at the next level, medium quality use. Games are well done on the iPad. They take advantage of the touch aspect of the device. In my opinion, games on the iPad are quickly moving up the quality ladder. For the office, there are Apple’s apps. The Pages word processing app looks like a winner. For document production, Pages appears to fill the bill. Especially without a Microsoft Word app on the iPad. The other major office apps – spreadsheets and presentations – are available as well. I really like the graphics program TouchDraw on the iPad. You can create very nice graphics, for business use, with just your finger. The simple graphic above was done with TouchDraw. While I couldn’t possibly survey all apps that address different activities, I get the sense that a number of them qualify for medium or high quality uses. The question is the breadth of apps addressing the “power use cases” of laptop owners. Finally, a word about the keyboard. I love it. I find it very easy to type out this post. It’s not without its imperfections, but generally I’m flying around it as I type. One disclaimer: I hunt-n-peck to type. I’ve never learned real typing. In my experimenting to see how much I could do with an iPad instead of a laptop, I’ve found several areas that need to be shored up to move the overall experience to the medium quality use level. Safari usage: Safari is the browser used for the web on the iPad. It is surprising how many sites aren’t built for usage via Safari. For example, wordpress.com, surprisingly in my view, doesn’t work well with Safari. Google Docs? Similar issue. Doesn’t work well, or at all, with Safari. I’m embedding HTML tags in this post-by-email blog post. I cannot accept an event into my Google Calendar via Safari. I cannot create a WebEx meeting from Safari, and the WebEx iPad app doesn’t allow you to create an event. In short, doing business via iPad is tough. As the iPad continues to gain market share, expect better support by websites for Safari. Which will dramatically improve the end user experience with the iPad. Graphics uploads: Want to add a graphic to a document, presentation, wiki, blog or email? Hard to do. We’re used to having graphics on our local drive, and a simple button to upload/embed that graphic. Where’s my master upload button on the iPad?!! Answer: there isn’t one. The graphic above is one that I emailed to Flickr, grabbed the embed code and pasted it into this post. Which works fine for publicly accessible graphics. But not so much in the work context. I’d like to see the native Photos app become a universal location for accessing graphics in any app. Stuff at my fingertips: The ability to easily click around different apps on the PC tray at the bottom of my screen, and to click quickly among different websites via tabs, is a great productivity benefit. If you’re like me, you’re zipping around easily. With iPad, it’s slower going back-n-forth. A lot of clicking the home button to get to other apps, or clicking the button on Safari to view other sites. Which is a pain, reducing the pace of work. So the iPad is still fundamentally in the low quality usage band, but with some clear indications of moving up. I’ve taken to using my iPad for my non-work hours computing needs. My full expectation is that slowly, but surely, Apple and the third party app developers will improve the utility of the iPad experience. It will take some time. That’s why I expect iPad to get better over time: market momentum. How about you? Are you thinking the iPad, and even the new crop of competitor tablets, will disrupt the laptop industry?